Are your processes driving how you use CRM? The SalesProcess360 CRM Audit is a systematic approach that will help you get ROI from CRM. The SalesProcess360 CRM Audit was developed out of a need we found while working with clients early in their CRM evaluations. They’d provide their specification lists, which were typically just a long list of features. The list would never include processes they wanted to improve using CRM. The SalesProcess360 CRM Audit will help you identify gaps in your sales processes and what it will take to fill those gaps. 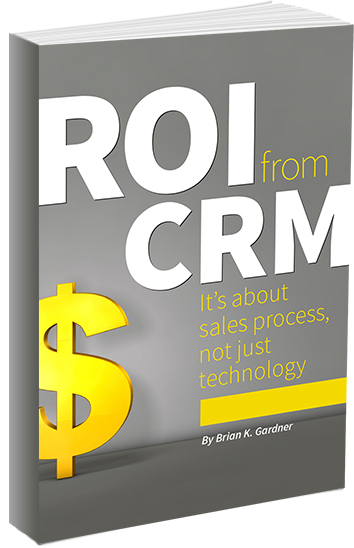 The result: a clearly defined plan for ROI from CRM based on your company’s true needs. Schedule a free phone consultation, where we’ll discuss high-level gaps you may have, what to consider for CRM and sales process success, and ROI considerations. Download this CRM Audit brochure to learn more about each step of the process. “Brian Gardner was very helpful in our assessment of readiness for CRM implementation. In addition to providing insights to the potential pitfalls of implementation, he helped our team understand the metrics that evaluate and measure the ROI obtained from CRM, and management commitment required to change the way that our organization works. As a result, we can better deliver value to our customers while improving our sales and marketing productivity.” – Wallace Lueders, director of business development, REXA Inc. Whether you are just getting started on CRM or already have CRM and want to get ROI, we can help. Invite SalesProcess360 to start the process off right with a CRM Audit. Or let us know how to contact you. Click here: Yes, I’m interested! Contact me about the CRM Audit.